VD102, VD105 are designed for long range VGA distribution over cost effective CAT5 UTP cable. 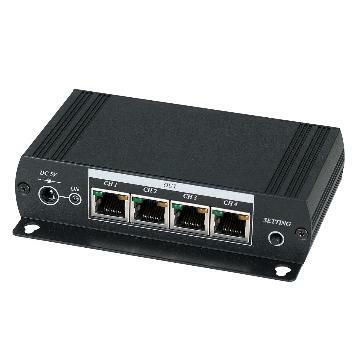 One or multi video input to multi output, with one VGA LOOP output (VGA cable) for local side, others are RJ45 output (CAT5 UTP cable) at remote side. All of them built in amplifiers for long- range VGA signal transmission up to 300 meters when work with TTA111VGA-R VGA receiver at remote side. Ideal for classrooms video distribution, lecture halls, retail kiosks, video information displays, overhead projector systems, PC-training systems, and tradeshows PC demo systems. Each set including one piece VD105-T VGA transmitter and one piece TTA111VGA-R receiver. Dual output: 1 VGA loop output for local, plus 4 x CAT5 RJ45 output for remote side. Each VGA display equipment request one TTA111VGA-R receiver at remote side (Order separately). Built in contrast, brightness adjustment at TTA111VGA-R Receiver. Use CAT5 cable instead of VGA cable.